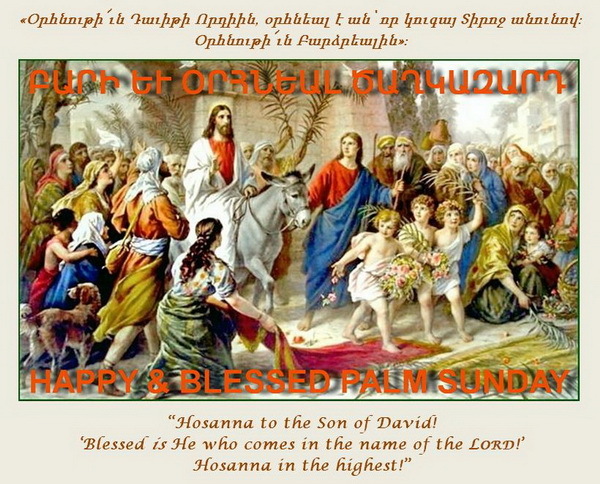 On Sunday, April 14, 2019, Palm Sunday, the triumphant entry of our Lord Jesus Christ into Jerusalem, will be celebrated in Prelacy Churches with Divine Liturgy, the children’s procession, and the Opening of the Portals service. H.E. Archbishop Moushegh Mardirossian, Prelate, will celebrate Divine Liturgy and deliver the sermon at Holy Martyrs Church in Encino. H.G. Bishop Torkom Donoyan, Vicar General, will celebrate Divine Liturgy and deliver the sermon at St. Mary’s Church in Glendale.